Photo by Shari Harris The gym was full of bounce houses and children filled the area as the evening progressed. loses his grip on the rock wall. 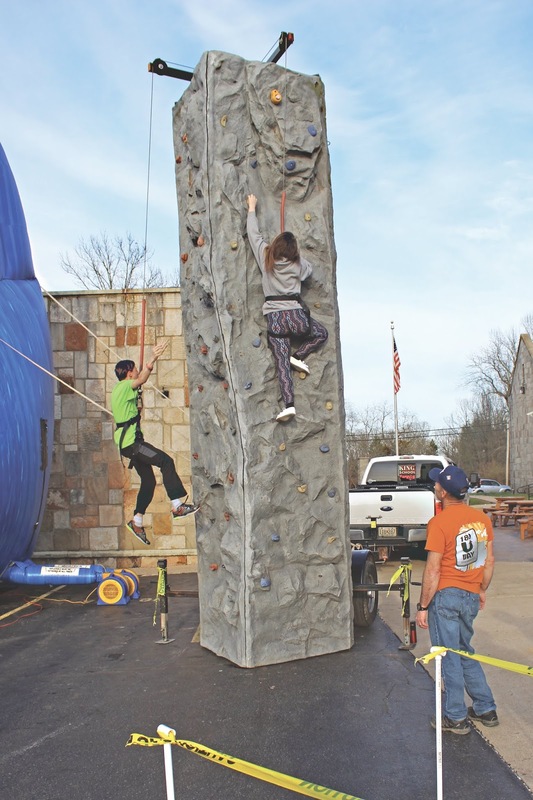 The Licking School District held their Family Fun Night on Friday in the High School parking lot and gym. It is an annual event designed to encourage parental involvement and is funded by the state due to the District being a Title school. The PTO and Parents as Teachers had information booths set up, brief practice MAP tests for students 3rd grade and up were completed to qualify for door prizes, and surveys were taken by parents in order to be eligible to win door prizes. Inflatable bounce houses, a batting site, a throwing site, and face painting were located inside the gym. A free bag of popcorn and a water were given out to each individual by Mrs. Smith and her helpers at the concession stand. The FCCLA provided baby sitting in Mrs. Kuhn’s classroom. Outside in the parking lot were rides including swings, a tumbling ride for two for older children or adults, a large bounce house, a large inflatable slide, and a rock climbing wall. Mr. Krewson oversaw application of harnesses to the rock climbers, and demonstrated how to conquer the wall. A large crowd attended and excited children filled the gym and parking lot. Parents and other family members enjoyed seeing all of the children having fun. Door prize winners of the two 32” TV’s were Bentley Cook (kindergarten), and Spencer Grover (11th grade). Parents won $20 Olig’s BBQ gift certificates as door prizes, with Anthony Brignole and Bridgette Love each winning. It was definitely a family “fun” night for all. Photo by Shari Harris Tabitha Melton, 8th grade, takes the lead as her brother, Ryan Melton, 9th grade, loses his grip on the rock wall.